This is part 1 in a 3-part series on the closure of Shuhada street and its impact on the community of Hebron. Walking down Shuhada street is undeniably eery and feels as if walking in a ghost town. Photo EAPPI/S. Robinson. Shuhada Street; most cities have one: the street that embodies the values of the community. The street where people meet and tourists visit. The street that breathes with activity and life. The street that symbolises all that it good and all that is bad in a city. New York has 5th Avenue, London has Oxford Street, Johannesburg has Bree Street, Paris has the Champs-Elysees, and Hebron has Shuhada Street. Or rather, Hebron had Shuhada Street. Shuhada Street rests in the soul of the old city of Hebron. For centuries it was the commercial and social heart of this historic city. Shop keepers lived above their stores so life on the street was not limited to trading hours. The main fruit and vegetable market operated on Shuhada Street and the access to side roads and slip paths originated from this street. It was a bustling and busy road full of activity and life for both Palestinians and Israelis. Then, in 1994, after the massacre at the Ibrahimi Mosque where a Jewish settler named Baruch Goldstein killed 29 Palestinian worshipers, the street was closed to Palestinian vehicles. When the second Intifada erupted six years later, the street was shut down completely. Shops were closed, people evicted, and Palestinian access banned in the name of security. Today, almost 20 years later, Shuhada Street is a shell of its former self. Broken windows are evidence that Shuhada street is now a shell of its former life. Photo EAPPI/S. Robinson. Many roadblocks separate Palestinians from Israelis on Shuhada Street. Photo EAPPI/S. Robinson. 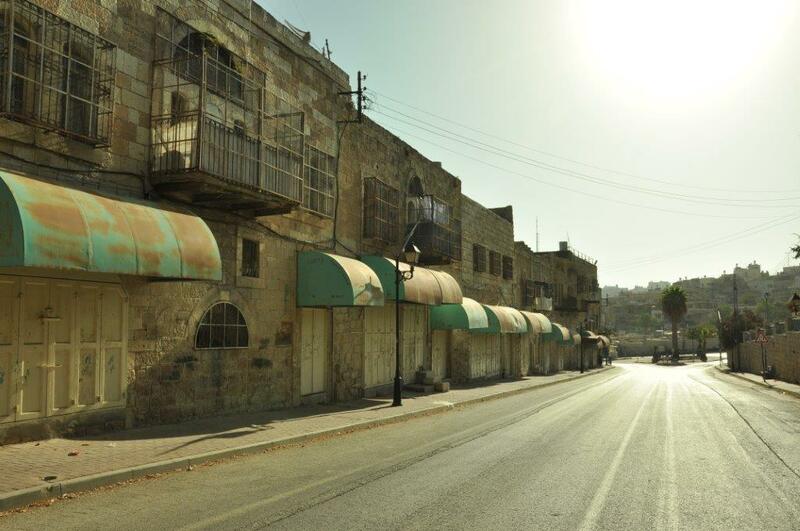 This once exciting and elegant stretch of Hebron is now a ghost town. Palestinians have access to approximately 100m of the street. Israelis have access to the entire street. Palestinians that still live on Shuhada Street are forbidden to use their front doors. Instead they are forced to find alternative routes to their homes through the back of the buildings and over roofs. The significance of Shuhada Street extends to both Palestinians and Israelis. There are three Israeli settlements on or near the street; Beit Hadassah, Beit Romano, and Avraham Avinu. These residents have full vehicular and pedestrian access to Shuhada Street. Several military checkpoints dot the road, all equipped with heavily armed soldiers. It is because of these settlers and their prioritised protection that Palestinians are barred. Walking down Shuhada Street is undeniably eerie. Stray cats and military dogs add to the mysterious images of broken windows, welded shut doors, graffiti stained walls, army jeeps, and shattered stone. The little life this street holds is quick to enter and often eager to escape. Many walls host Israeli posters describing the history of the street albeit remarkably one-sided. Occasionally the face of a small Palestinian child peaks through a caged window on the second floor of a building curiously inspecting a street they have never stepped foot on. Israeli children catch buses to school and settlers enjoy a morning run on this stricken street. The separation is seamlessly clear. The story of Shuhada Street is not complete. Several chapters are yet to be written. Many organisations are tirelessly campaigning to open Shuhada Street. The separation cannot be sustainable for Israelis or Palestinians. Until the street is opened, the dream of what Shuhada Street could be is just that; a dream. This entry was posted in Freedom of movement, Settlements, Violence and tagged access, b'tselem, baruch goldstein, freedom of movement, hebron, israeli, palestinian, second intifada, separation, settlements, settlers, shuhada street, southern west bank by EAPPI. Bookmark the permalink.